Green is the Orator follows on Sarah Gridley’s brilliant first collection, Weather Eye Open, in addressing the challenge of representing nature through language. Gridley’s deftly original syntax arises from direct experience of the natural world and from encounters with other texts, including the Egyptian “Book of the Dead” and the writings of Charles Darwin, Peter Mark Roget, William Morris, William James, and Henri Bergson. Gridley’s own idiom is compressed, original, and full of unexpected pleasures. This unusual book, at once austere and full of life, reflects a penetrating mind at work—one that is thinking through and re-presenting romantic and modernist traditions of nature. 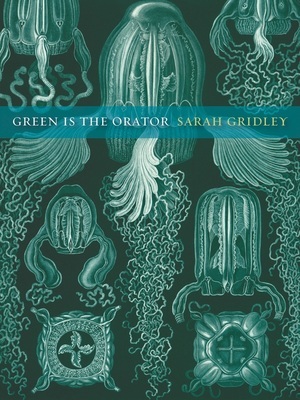 Sarah Gridley is Assistant Professor and Poet in Residence at Case Western Reserve University and is the author of Weather Eye Open (UC Press). Is He Decently Put Back Together?